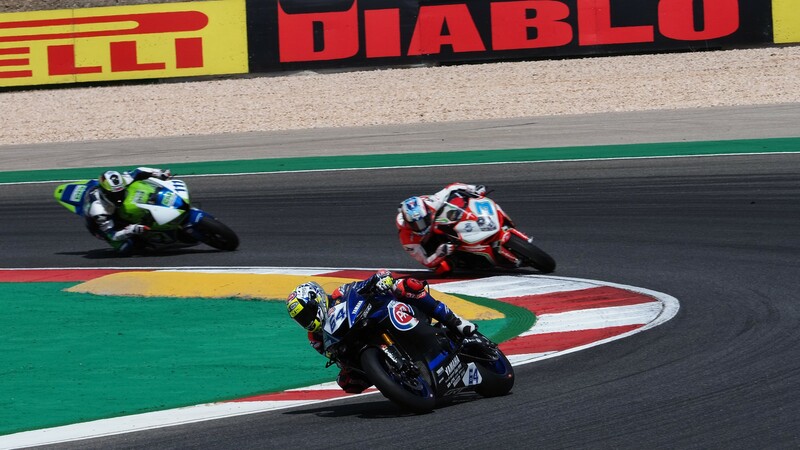 Federico Caricasulo (GRT Yamaha Official WorldSSP Team) has scored an important win at the Autodromo Internacional do Algarve ahead of the impressive Kyle Smith (CIA Landlord Insurance Honda) and Raffaele De Rosa (MV Agusta Reparto Corse by Vamag), in perhaps the most extraordinary and bizarre race end in FIM Supersport World Championship history, after Lucas Mahias (GRT Yamaha Official WorldSSP Team) was denied a return to the top of the rostrum twice in the space of five minutes. A lightning start from Jules Cluzel (NRT) at the lights moved him immediately into first place. It lasted just one lap however, as Mahias made good use of slipstream to move back in front at the exit from the main straight. 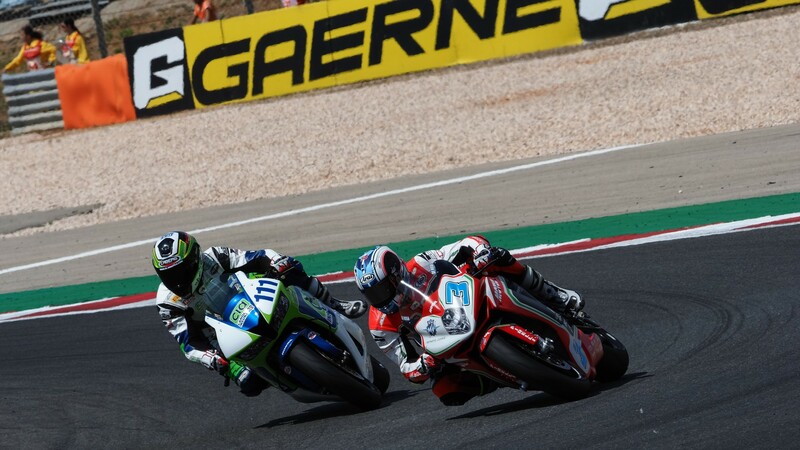 Then, disaster struck: championship leader Sandro Cortese (Kallio Racing) attempted a move into second at turn 5, another in a series of stunning battles that both men have held this year. But this was one move too many: the German slipped, taking both him and Cluzel out. A racing incident that nonetheless harmed the Frenchman the most, as he was forced to abandon while Cortese, holding on to his machine all the way down, managed to recover and head back in pursuit of some points. With their two strongest rivals out of action, this ninth race of the season quickly turned into a GRT battle. 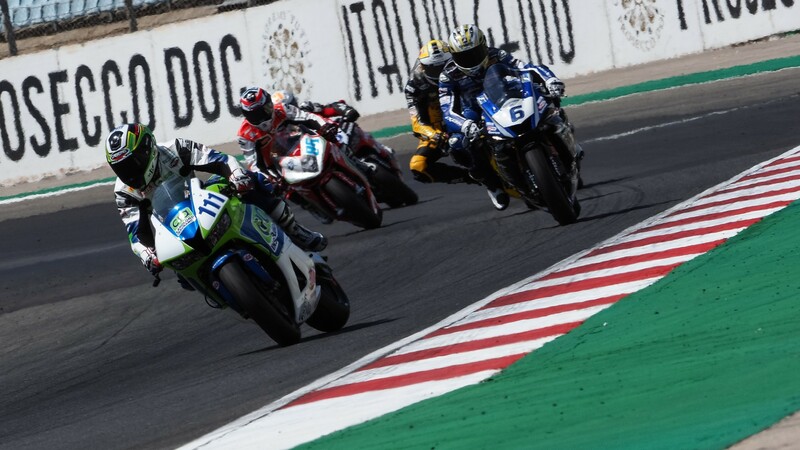 Separated by just a point in the standings and with both riders in search of their second race win of 2018, Mahias rapidly opened a one second gap with Caricasulo, taking the fastest lap of the race along the way, and entered the final lap with a comfortable lead. What happened next was almost too ludicrous to describe. A puncture going through the main straight at the start of the final lap for Mahias apparently put his race to an end in dramatic fashion, a heartbreaking final twist in a tough season for the reigning champion. But then the red flags came out: Rob Hartog (Team Hartog – Against Cancer) and Borja Quero Martínez (EMPERADOR Racing Team) had crashed together at turn 11 in the previous lap, meaning that the results going into the penultimate lap of 18 would be final… As long as every rider makes it back to the pits within five minutes of the official race end. With his machine still rolling, Mahias set out around the Portuguese track without a rear tyre, for perhaps the longest lap of his career. In incredible conditions and crashing twice along the way, Mahias made it to the pits in what he initially thought was within the five minutes; however, the Frenchman had cut through the track for the final turn, and was thus deemed to have failed to return to the pit-lane in a legal manner within the time limit. As such, everyone moved up a position, with Caricasulo taking an unlikely yet incredibly valuable second consecutive win, and an exhausted Mahias was left with no points for his efforts. 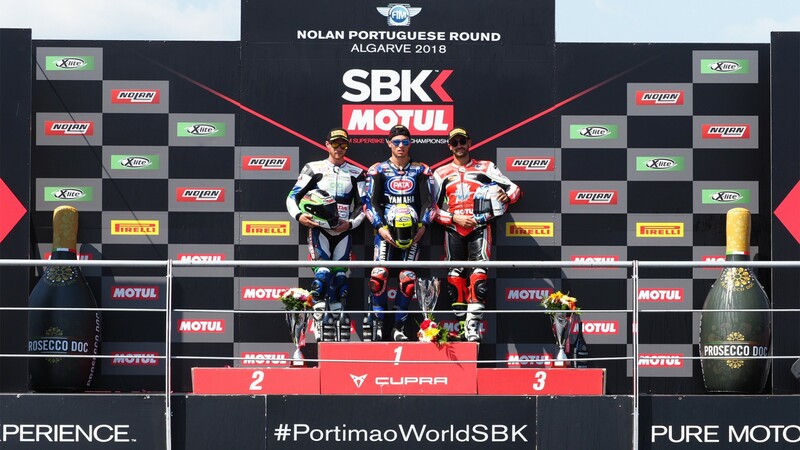 British rider Kyle Smith managed to move up to second with this, taking his first podium of the season and the first for a Honda bike, after overtaking De Rosa – who has now strung six consecutive podium finishes together – for third in the late stages of the race. 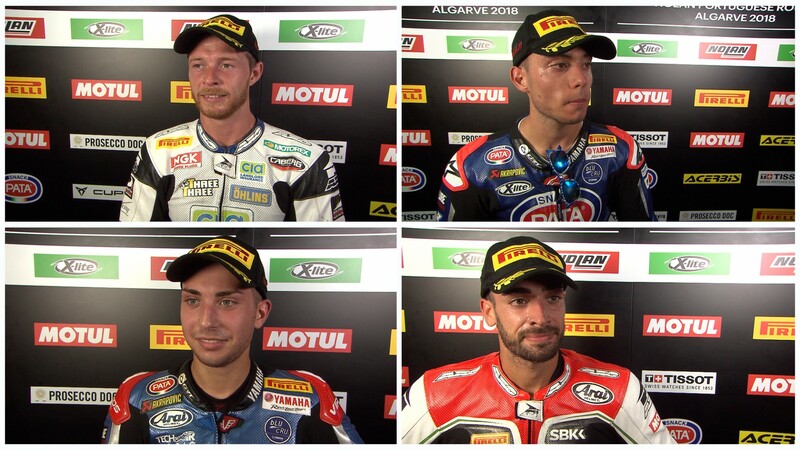 Randy Krummenacher (BARDAHL Evan Bros. WorldSSP Team) takes fourth in the final results, a good result for the Swiss rider after a poor start. 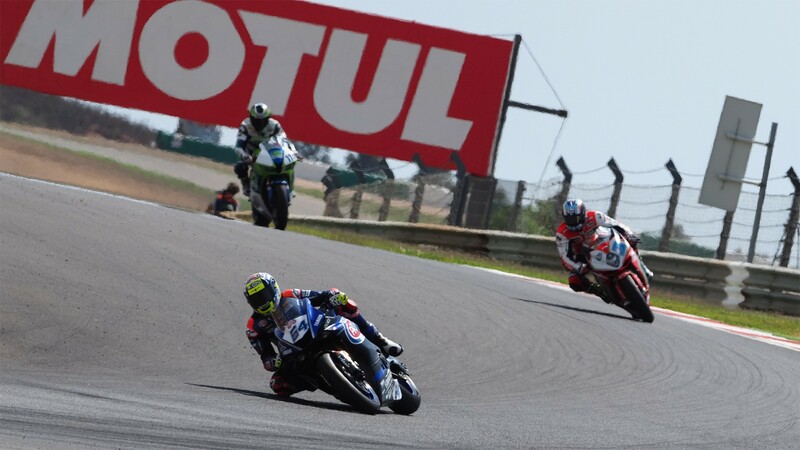 Hidden beneath all the late drama, Cortese made it to the flag in an incredible fifth position despite that lap two crash and increases his championship lead against all odds. 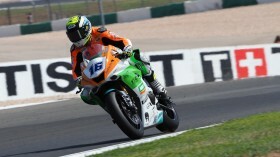 Hannes Soomer (Racedays) concluded a fantastic weekend for the Estonian with sixth place, ahead of Ayrton Badovini (MV Agusta Reparto Corse by Vamag) in seventh and Thomas Gradinger (NRT) in eighth, with Hikari Okubo (Kawasaki Puccetti Racing) in ninth and Hector Barberà (Kawasaki Puccetti Racing) tenth in his WorldSSP debut. 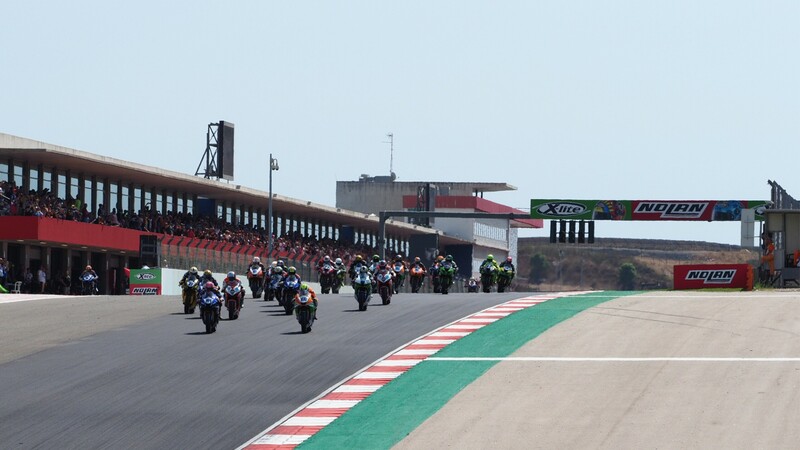 Rewatch the full Portimao race and all the highlights from this year’s WorldSSP action thanks to WorldSBK VideoPass.